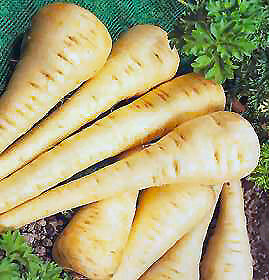 The Gladiator parsnip is the world's first hybrid parsnip. It is a fast maturing, with a consistent high quality flesh, with a silky-smooth white skin and has a very good resistance to disease. It is a superb, sweet, crisp-tasting vegetable. Parsnips are much underrated mainly because of a lack of imagination in cooking. For long parsnips you need to dig a deep drill which has been manured for a previous crop. They will however do well on ordinary well drained and cultivated soil. Sow from April to June, 1cm (½ inch) deep in drills 30cm (12 inches) apart. Sow in clusters of 4 seeds every 20cm (8 inches) and thin out to the strongest seedlings after germination. Germination is very slow. Harvest the roots from autumn onwards, leaving them in the ground until required. Fried parsnips can be a very tasty dish. Boil first and finish off in a frying pan with a knob of butter and sprinkle them with brown sugar. Prepared this way they acquire a particularly crisp and sweet taste.